A exceptional example of a late 19th century town clerks wig. A wonderfully complete example, the wig comes supported by its original wig stand & incased in a beautiful sign-written toleware tin with a hinged lid & brass handle. 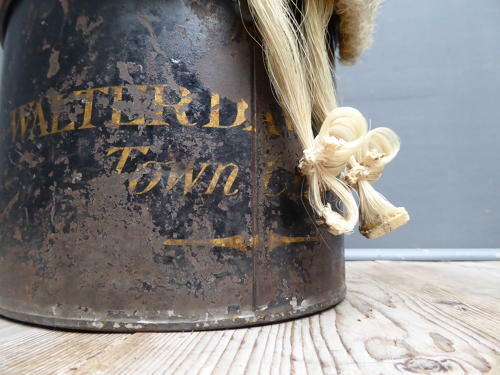 The wig itself of the absolute highest quality & labelled 'Ravenscroft, 1 Star Yard, Lincolns Inn Fields' & the inner lid of the tin is marked, 'Ede & Son, Robe Makers to Her Majesty, 93 - 94 Chancery Lane, London'. Ede & Ravenscroft were established in 1689 & remain the absolute pinnacle in tailoring to the Royals & Judiciary, holding all three Royal Warrants. The name Walter Dawes Esq requires further research at the time of going to press but it appears he was both a solicitor and town clerk in Rye during the late Victorian / Edwardian period. A superb piece of history. Wear commensurate with age, very good original condition.